quilt, fabric, virginia robertson, pattern, applique, foundation piecing, paper piecing, color symphonies, doll pattern, fairy pattern, jester pattern, wallhanging, clothing, bag, cortez, quilted, fabri-quilt, Bali, bead, beading, material, yardage, quilt kits, wholesale, Osage County Quilt Factory - Spring ! 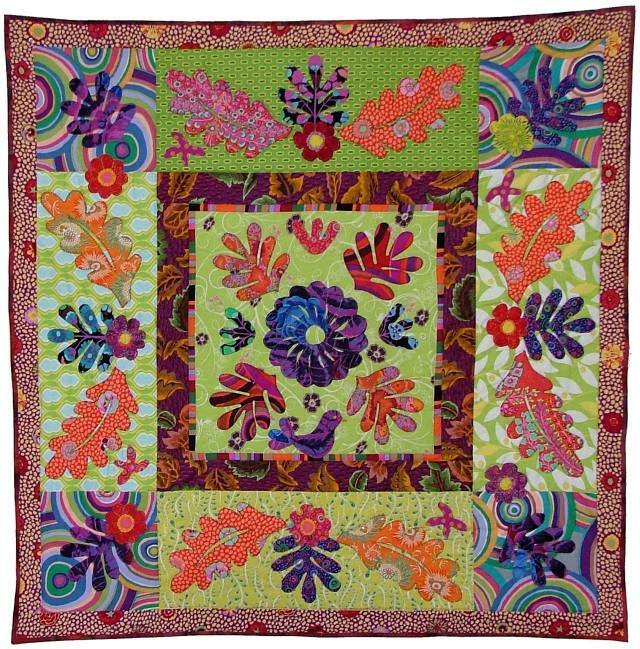 Two contemporary folk art quilt ideas are included in this pattern. The 47" X 47" wall hanging was featured in the Dec. Jan. issue of Quilter's Home magazine. Read about the design process behind this art quilt on Virginia's blog. Click here to see the other queen sized photo of the quilt. The 70" X 104" quilt is created entirely with batiks from Bali Fabrics.